A mouth-watering, delicious, home-cooked eating experience in an informal and friendly atmosphere in an historic building with views. Childrens menu available. Families very welcome. Gluten-free and vegetarian options are included on the menu as standard. The Siabod Restaurant is named after the mountain ‘Moel Siabod’ which is 872m or 2861 feet high and rises from the village. 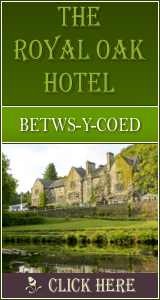 The main restaurant and the Garden Room enjoy beautiful views over the Lledr Valley. Wherever possible, all our produce is locally supplied using the highest quality suppliers in the Conwy Valley. These include O.E. Metcalfe, a multi award-winning butchers, Harp Stores in Llanrwst who supply all our fruit and vegetables, The Glasfryn Estate who supply our unbeatable Welsh Black beef burgers, TJ Parry and Daughters butchers in Trefriw who make our deep-filled Welsh Black pies. To compliment your evening meal, we have an extensive wine list to suit all tastes. Afterwards, enjoy a drink by the wood-burning stove in our historic bar/lounge. The restaurant has won the Rural Conwy Business 'Eating Out' award. 1354 Click Throughs => �677 based on an example �0.50 cost of a click through from Google pay per click. The click through ratio to this accommodation provider's own website is 15% .